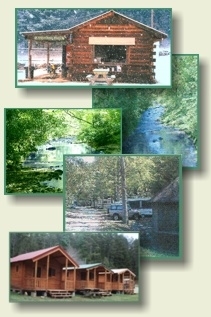 Whispering Pines Campground offers something for everyone. Escaping the bustle of everyday life? Enjoy our tent and RV sites, all with a fire ring and picnic table - most of which border beautiful Hemptown Creek. Need a cabin? Our roomy, rustic cabins feature ceiling fans and six-foot porches. Prefer to be pampered? Our deluxe full-service cabin provides all the comforts of home! Through out the year there are many activities, fairs and festivals such as: Art in the Park, Scottish Games, Pickin’ in the Park, Georgia Marble Festival, Sorghum Festival, Georgia Apple Festival, Blue Ridge Fall Harvest Sale, Cherry Log Festival, Georgia Mountain Fall Festival, Fall Festival at the John C. Campbell Folk School, October Fest in Helen and the Kiwanis Rodeo. Check the local chamber sites for dates. Many Festivals take place in October, an especially beautiful time to visit, with the changing of the leaves and the nip in the air. We are adding some great photos and info in our gallery - check often for the latest info.